The color blue offers an enormous amount of depth. Staring into anything that's blue can take you on a journey up into the endlessness of the sky, or down into the bottomless depths of the ocean. It can have a light and tropical warmth, or a dark and mysterious coolness. It can offer an ancient wisdom, or evoke the significance of a newborn baby. And since we have all the different types, styles, shades, and sizes that blue shoelaces could possibly come in, you'll find your true blue, and it will create the ultimate you shoe. Whether the pair of laces that came with your shoe totally blew it, or you have a simple solution to stylizing your shoe ("Just blue it! 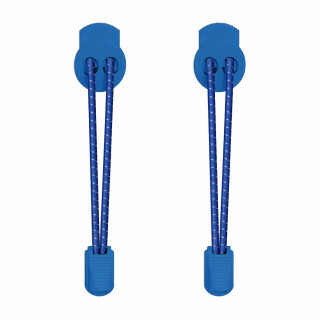 ), our blue shoelaces make the perfect replacements. While the types range somewhat considerably, we make sure the widths are standard to slide into any pair of shoes, and they come in any length, so you don't have to worry about getting a pair that's too long or too short. Basically, Goldilocks, your laces will fit and look just right, because we cooked up a delicious collection of blue shoelaces. 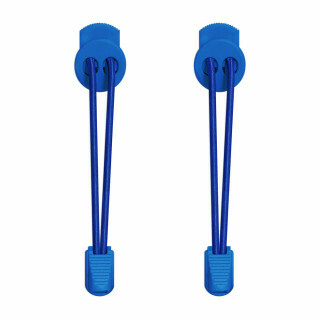 "Blue shoelaces" is an umbrella title, one that encompasses an absolute ocean of options. Find a pair for hiking boots or running shoes, formal shoes or sneakers. We also have more specialized options, like elastic no-tie blue shoelaces as well as reflective and leather options. 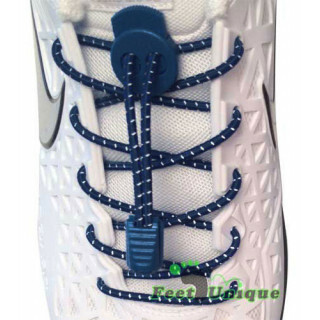 We're upfront about the width you should be looking for depending on your shoe, and we make it a point to offer a range of lengths, since the only thing more annoying than laces that are too long is laces that are too short. Put simply, we make it rain shoelaces, and scrolling through is like stomping around in big puddles of high-quality excellence. 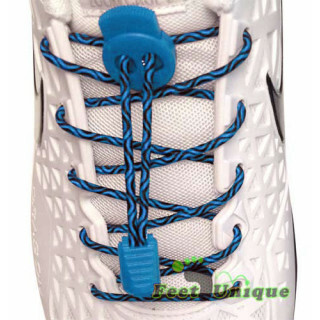 The Best Blue Shoelaces, Period. Some brands say it until they're blue in the face, but we do more than say it, we live it. 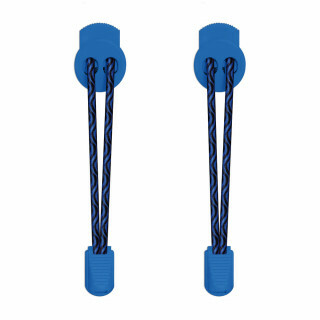 Our shoelaces have the highest friction possible so that they never come untied. The quality and durability ensure that they last forever, and if they somehow don't, we'll give you a full refund with no expiration date. Shipping is free, the prices are always right. In summary and for the sake of this wordplay: when it comes to putting a pair in your shoes, they're shoe-ins, and they're showoffs. This big blue marble we call a planet deserves shoelaces that don't make it blue. That's why all of our offerings are certified STANDARD 100 by OEKO-TEX®, an independent company that verifies eco-responsibility at every phase of textile production. You can learn more here, and you can step outside and take a deep breath of fresh air to experience our impact firsthand.